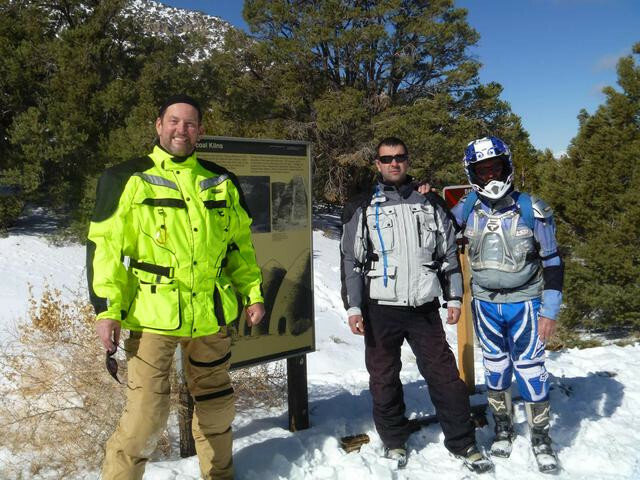 Discussion in 'Ride Reports - Epic Rides' started by GalacticGS, Mar 22, 2011. Tasked to start the ride report for this year's nOObs rALLy DV march MADness 2011 adventure, I'm taking a cue from joefromsf and starting this thread a few days early. The un-organized group rides will begin on Friday, March 25. Some of the inmates are already on their way to DV. 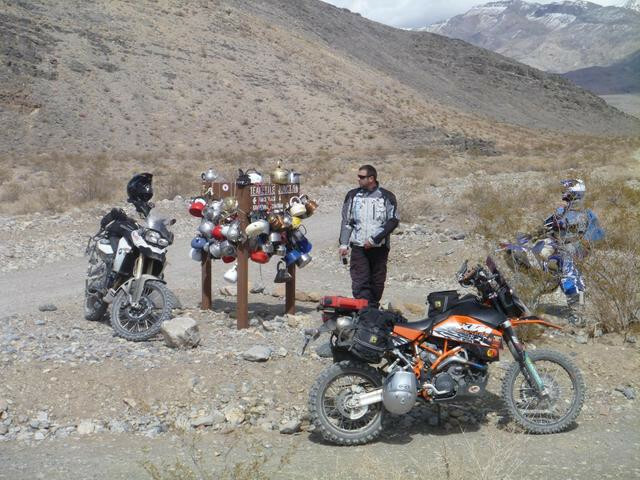 Last I heard, joefromsf was somewhere near the Tecopa Hot Springs. 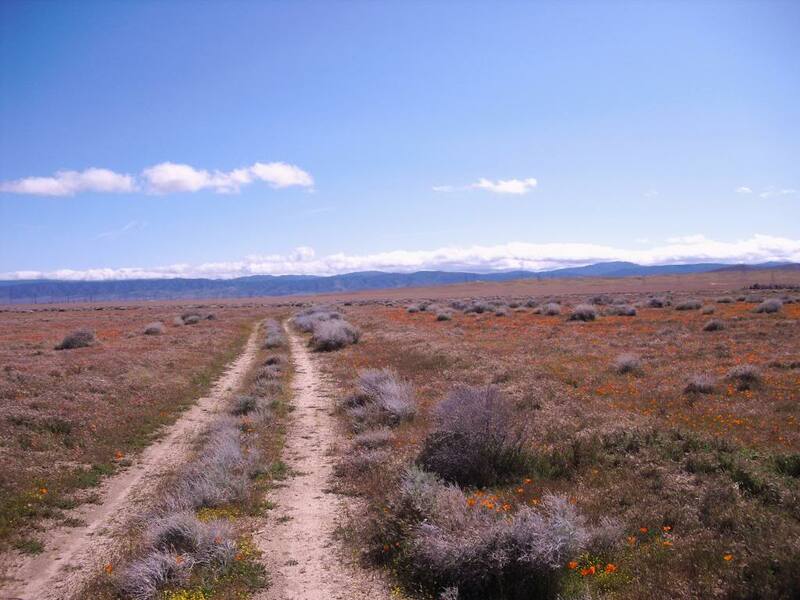 Others are on their way south, some coming from the east, and a gaggle of adventurers will be heading north over the next couple of days - all heading towards the Panamint Springs campground in Death Valley. Well over 100 inmates will be gathering for this un-organized non-event. A big thanks to h8chains once again for doing his best to herd the cats involved. Once again, it will be epic adventuring!!! HMMM... WHAT DOES THE GREAT CARNAC KNOW ??? AND US MERE MORTALS ARE AWAITING TO FIND OUT ! The long version starts from Seattle last Thursday ... but the short version is that I left San Francisco around 1030 am Wednesday morning after checking the weather. Took Hwy 101 south and for the first few miles the weather was clear ... but the rain started soon enough and I mostly kept to the slow lane because of poor visibility (and the kamikaze Cali cagers). The rain cleared up about the time I left the multi-lanes behind around 85 miles south of where I started. But not wanting to be outdone by rain, the winds kicked up at that point and continued for the next 100+ miles and there was a few times I thought I was going to be blown into oncoming traffic. I kept to the far right of the lane after that and so when I got pushed over a few feet I didn't end up decorating some trucker's front grill. Took 46 east and the winds slowly calmed even as the rain picked back up. By the time I got to 99 south the rain was coming down hard and the fog/ once again made visibility almost nil. But I was only going as far as Bakersfield for the day ... and made it there just before 5 pm. Weather is looking dodgy for tomorrow's ride to PSR via 58 so still considering alternate routes ... will be checking things in the morning before heading out. Wayward - Sounds like a bit of a tough day. Hopefully the weather is better tomorrow for you. My ride out began from O.C. 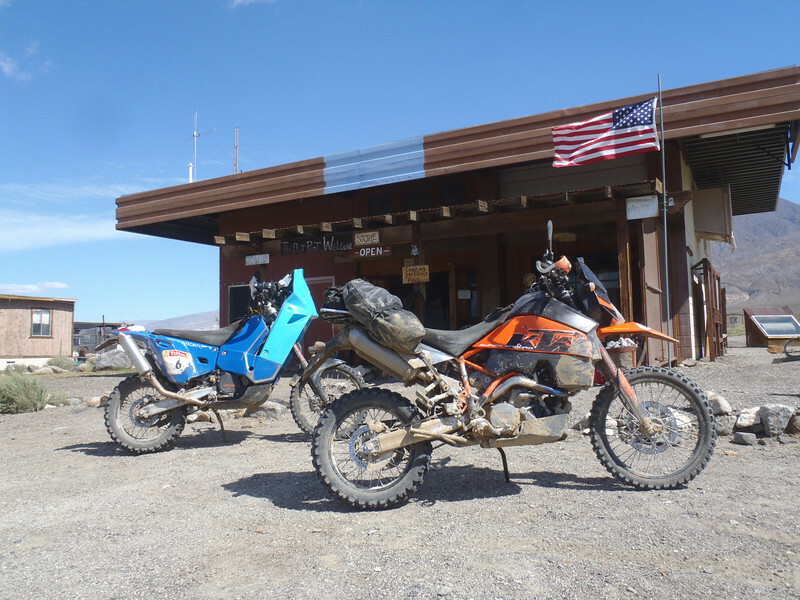 I hooked up with Francisthepig on his 800GS and we rode 395/Trona/Panamint Valley out to PSR Thursday afternoon. It was a cold and windy ride, but thankfully, no precipitation! 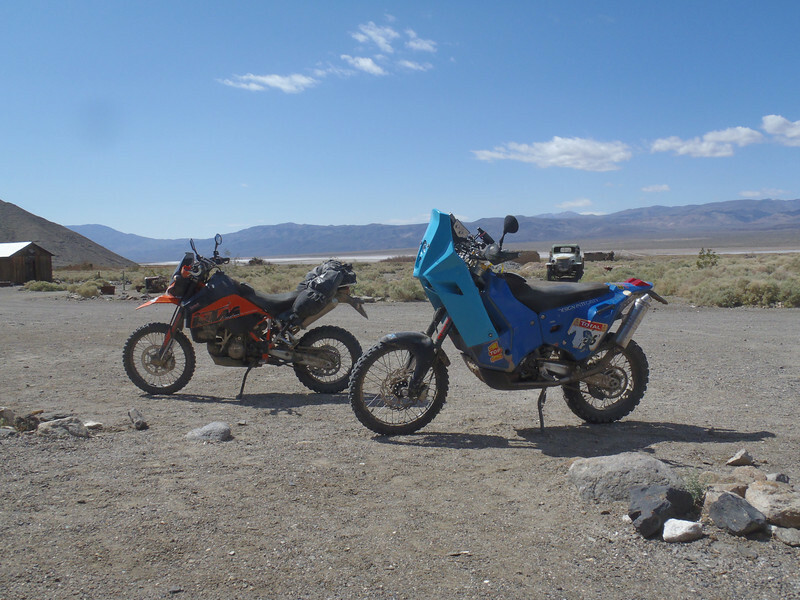 On Friday morning, I hooked up with Liorsmotoride and his friend, Damon for a ride to the Charcoal Kilns, Ubehebe crater, Teakettle junction, and Scotty's Castle. I've been to D.V. 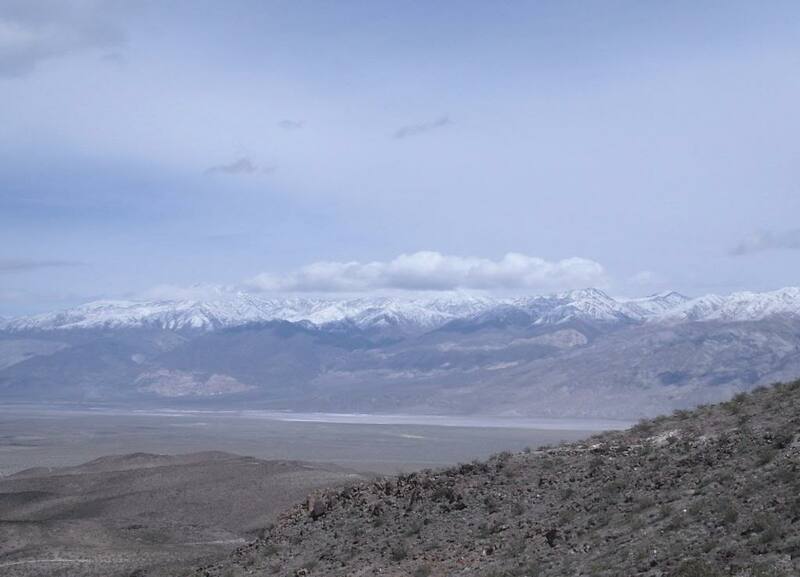 several times since 2002, and have never seen so much snow on almost every mountain range around Death Valley. On Saturday, I packed for home. Lior was still busy helping inmates fix bike and car? problems before I left. I chatted with Cathy before departing, while Lior helped out. Lior finally was able to leave for a ride to Darwin and we parted ways. Many thanks to Joel and all the volunteers who made this event possible. Wish I could be there.... Hope everyone had a great ride with minimal carnage. Here's a toast to past rides and future ones! Sorry you couldn't make it. 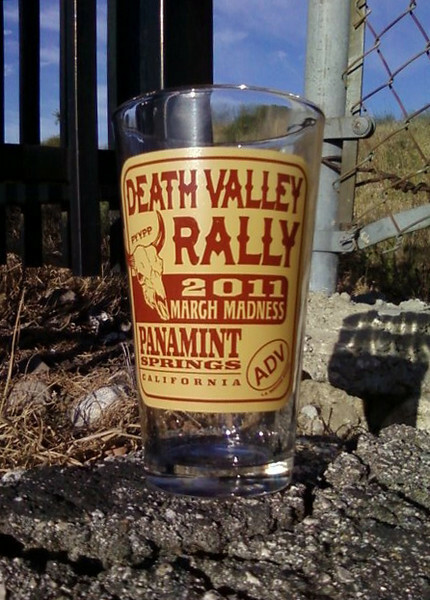 I still have your slave cylinder for the 950 and an extra noob rally glass you just have to show up to claim them. 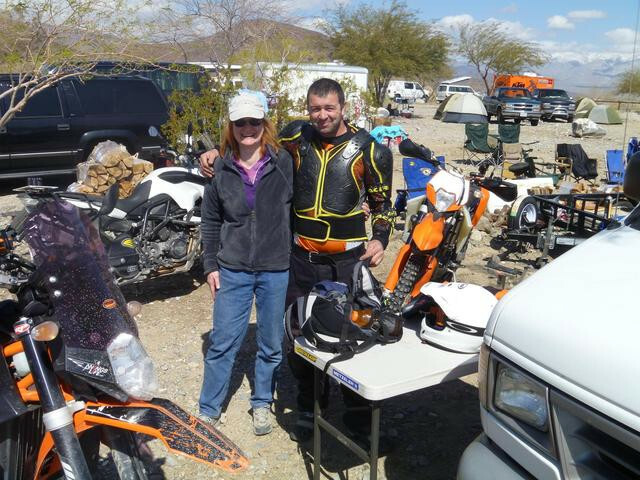 It was another great n00bs rALLy in Death Valley. Kudos first of all to h8chains (Joel) who's been the lead organizer for March MADness for the past several years. He does an amazing job trying to organize the chaos of an un-organized ADV event. DSM8 awarded Joel with a brass cowboy hat on Saturday night for "herding the cats". But there's a lot of support from a lot of people. I wont remember everyone, but thanks to all of those that chipped in to help in pulling this event off. Not sure of exact numbers, but there were about 150 signed up. Many backed out at the last minute (several due to the weather in just trying to make it to DV). Those traveling from the north faced some pretty fierce weather conditions to make it to DV. I think about 120-130 actually made ended up participating. 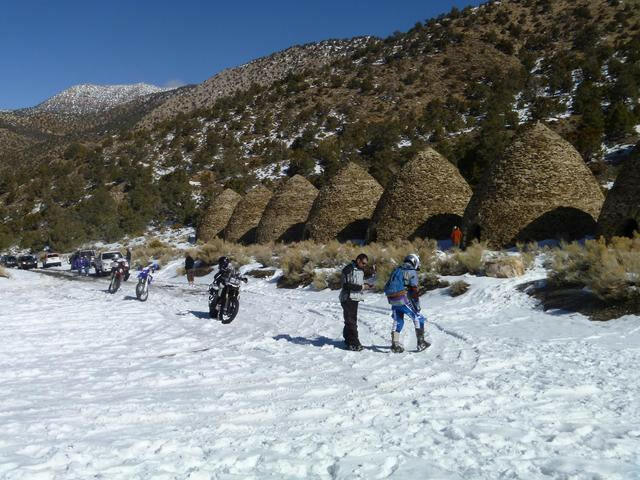 But once everyone arrived, the weather was great for riding. 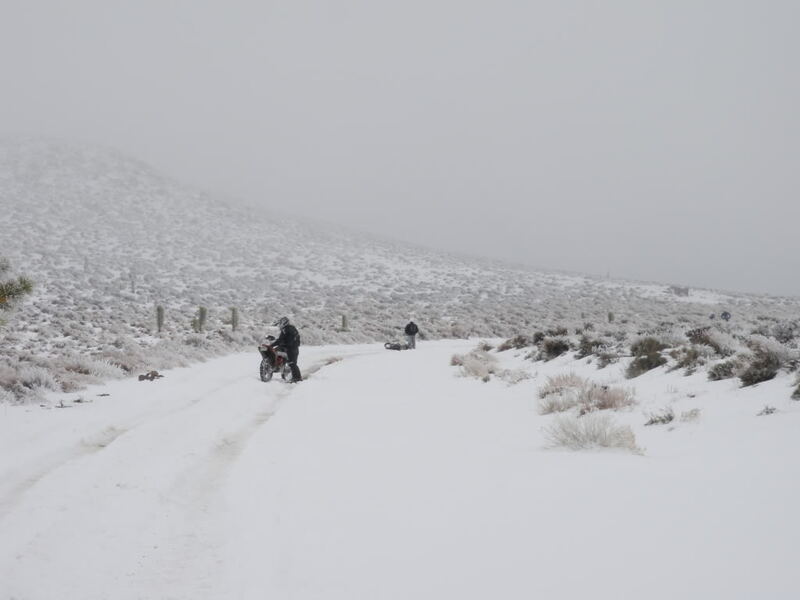 Unfortunately, a few passes were still closed due to snow which caused some last minute rearranging of planned rides. Were an adaptable bunch, and it all worked out. Some even braved the snow. Hopefully we'll see more pics and stories from them. 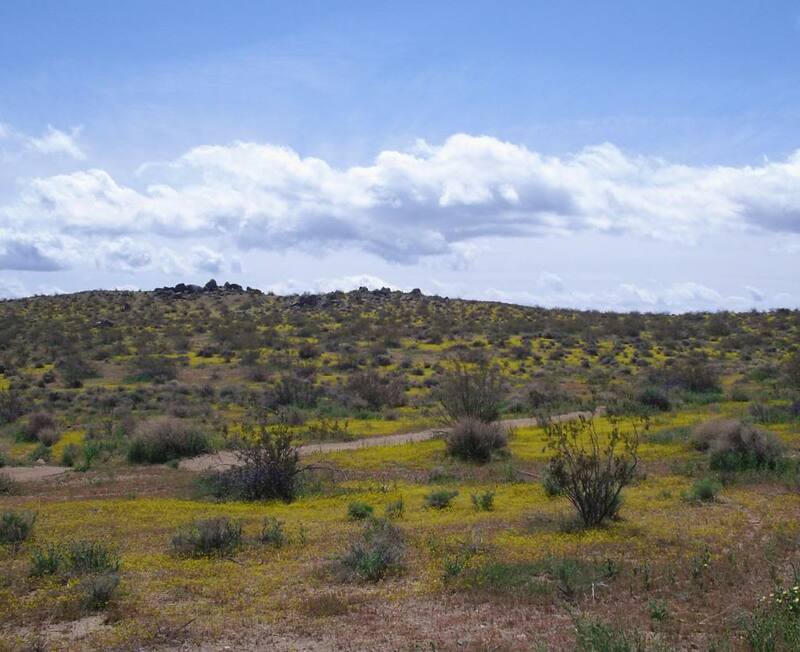 You never realize how vast DV is until you get 100+ riders out there, and still you (usually) never see more than your particular riding group out on the trails. 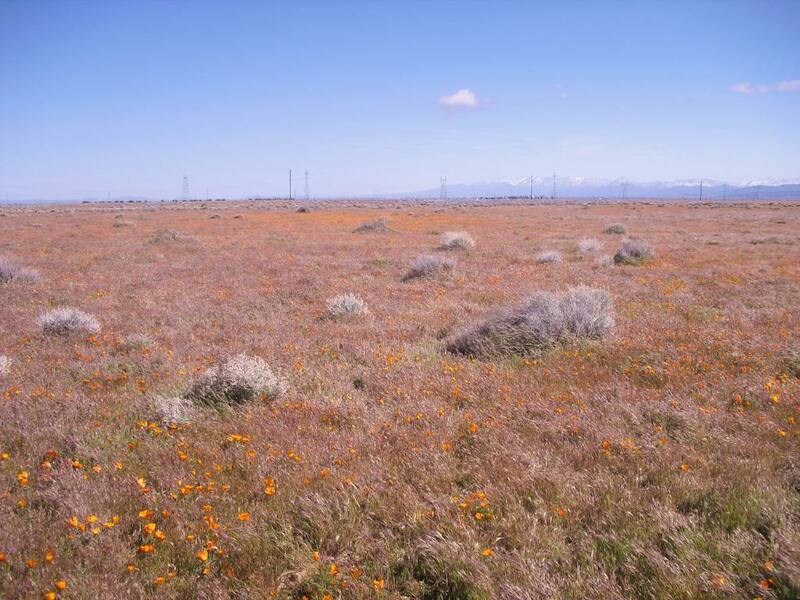 DV National Park is approximately 3.4 million acres. 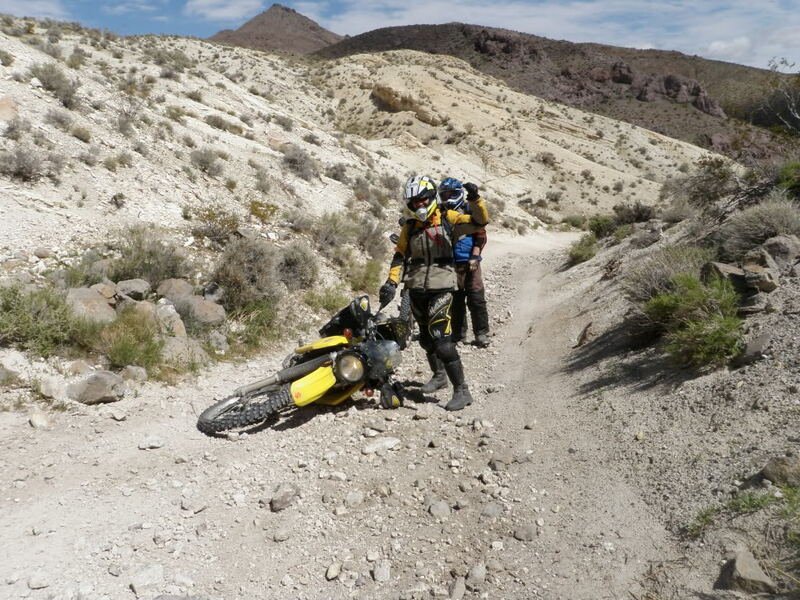 Although there's no true offroad riding (you need to stay on designated roads paved or unpaved), there's over 1000 miles of those "roads" to explore, and many of them are pretty rough and challenging. Some of the organization of the event shows up in the fact that I believe the worst injury incurred was a sore finger. I think only one person had more than one flat (not sure how many had flats overall but don't think it was a large number this year). Riders ranged in age from 17 to 59, and I think one guy over 70. Wayward Rider travelled from Seattle and showed up on her Triumph Bonneville. 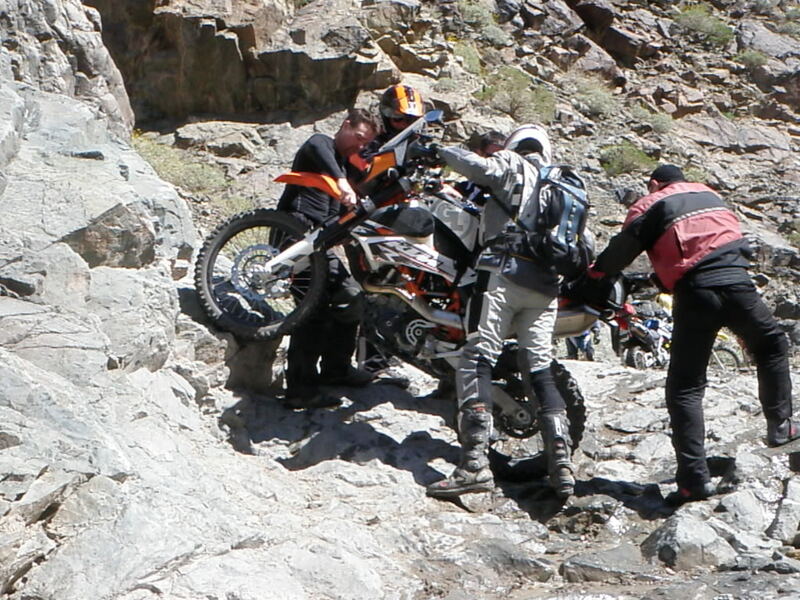 Not sure where KJ travelled from but I think I heard he rode in on a DR200. It was a diverse group, and everyone got along just fine. Everyone looked out for all those in their riding groups, and everyone was accounted for. I believe the police were so impressed with us that they awarded a few with a summons to return (or the chance to pay a few extra dollars to the cash-strapped Calif or Nevada governments). Unfortunately my camera stopped working on the very first morning. I'll provide some commentary on the rides I took but will depend on others for the pics. though i said something at the other thread, i like to repeat it again here. we definitely have an awesome community here in california! you guys made this happen. thanks to all, especially to all the volunteers and those who made outstanding contributions to our funds. you guys rock...aside from rewarding ourselves with cool awards and raffle prizes, we were able to generate $$$ to support 3 charitable organizations...rider down org, corva, and blue ribbon coalition. 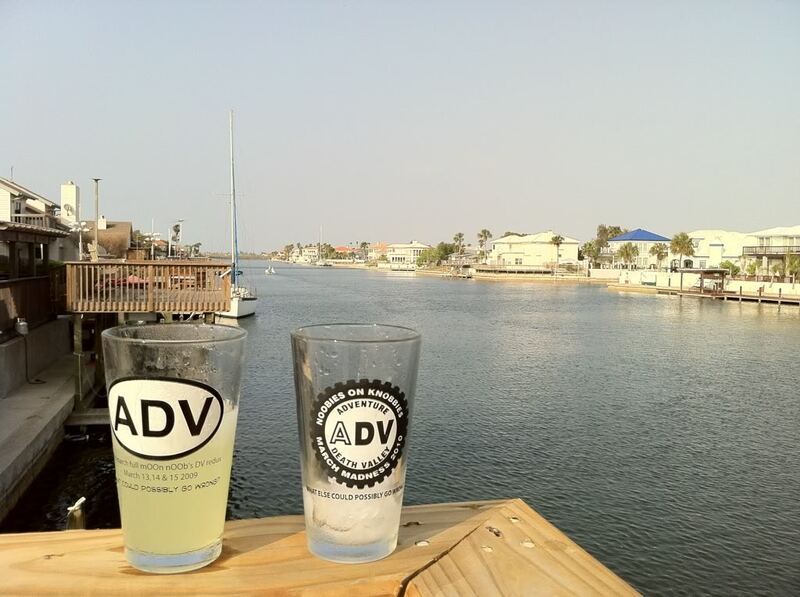 also we got some $ going to the ADV Website. 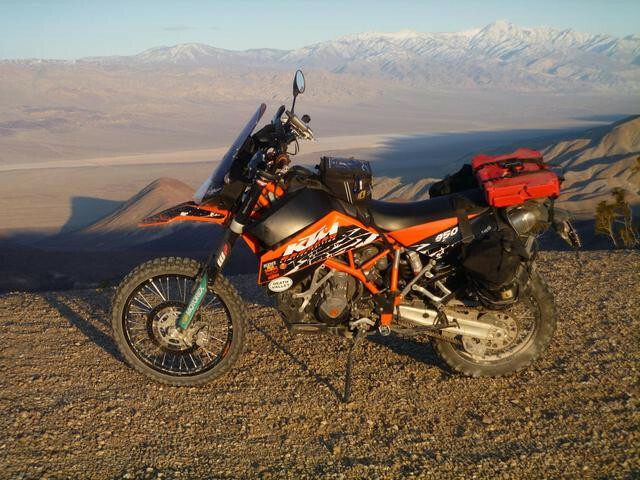 awesome weekend, great riding in death valley, almost the perfect weather, no major injury, no 4-digit carnage, met a lot of pucks, made countless friends, tons of great stories to share, and of course the great memories we will cherish as we ride towards the sunset. This old fart made it home safely on all 3 wheels. Thanks Joel for organizing a great run. Thanks to Javier for the work on the clutch master cylinder. Here's a photo of my campsite, showing that I did in fact ride in. Thanks to Lior for trailering my broken bike out of DV for me. Thanks to H8chains and all of the volunteers for their hard work and dedication. Thanks to RobG for the ride back (although we are not leaving until morning). Thanks to Conestogaman for getting the seal from the Vegas BMW dealer. It was great meeting everyone. I hope to see people down the road in the future. I had a blast even though I was unable to ride anywhere after arriving. Sitting in a hot spring. Soaking off the four glorious days of riding. spotwalla page will confirm it. Huge thanks to everyone for pulling off such a great non event. Cheers.